Scores of serving and former police officers and staff gathered at an Aberdeen church at the weekend to honour more than 100 fallen comrades from the force. 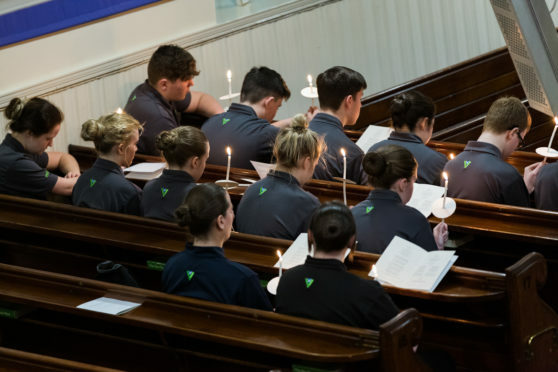 A poignant candle-lit service was held at St Mark’s cathedral on Rosemount Viaduct on Saturday giving the force the chance to remember now departed colleagues. Welcomed through the doors by a tartan-clad police piper, staff from the now existing Police Scotland north-east division were joined by predecessors from former forces including Elginshire Constabulary, Aberdeen City Police, Aberdeenshire Constabulary, the Scottish North Eastern Counties Constabulary and Grampian Police. Young and old listened solemnly as 103 names were read out during the service and candles lit to represent their lives. Now in the 12th year, the memorial is becoming an increasingly important event in the police calendar. There is already a well-established national memorial service held at the Scottish Police College in Tulliallan on the first Wednesday of every September, but this service gives the opportunity for families and staff based in the north-east to come together locally. Situated in the grounds of the Police Scotland College in Fife, it was dedicated by HRH the Princess Royal on 7th September 2004 and features the names of all Scottish police officers who have died on duty dating back to 1912. President of the north- east branch of the Retired Police Officers Association Scotland, Kenny Thomson, said that the affected families “appreciate” the local memorial. He said: “The memorial service is an important opportunity for officers, current and retired, to come together with the families of colleagues who have passed away, in order to remember them. “The names of 103 former colleagues were read out at the service and candles were lit to represent their lives. Further north, there have been calls to name streets after fallen emergency service workers. Former police officer Dave Conner has called for street names in Inverness to be named after those who died in the line of duty.